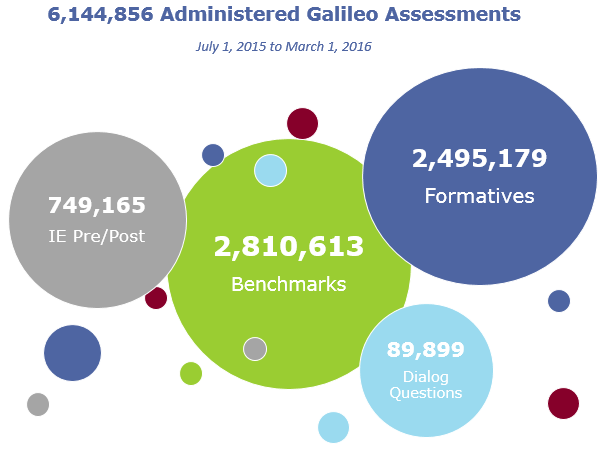 The Galileo® comprehensive assessment system is among the most extensive and robust assessment systems in the nation. ATI creates thousands of unique tests each year and supports the administration of those assessments to millions of students. The Formative Assessment component of the system plays a critical role in documenting student learning, evaluating curriculum effectiveness, supporting differentiated instruction for intervention groups, and supporting individualized instruction to assess the achievement of personal learning goals. ATI formative item banks currently contain over 50,000 certified items. These continuously updated banks are created and managed by ATI content specialists with advanced degrees and years of experience providing users with one of the largest and fastest growing formative and secure sets of item banks in the country. New proprietary technology has enabled ATI to develop seventeen different types of Technology Enhanced (TE) items ensuring that users will have access to the latest item formats when creating assessments. ATI’s partnership with Key Data Systems provides an additional 37,000 formative assessment items from the INSPECT® item bank. Planning technology and test generation technology built into the system make it easy to build multiple formative assessment series aligned to the state blueprint and/or reflecting the district curriculum. Automated formative test generation minimizes the work required to assess student knowledge and skills in differentiated instruction initiatives. Automation also provides formative assessments attached to curriculum lessons supporting automated curriculum evaluation. Finally, technology enables teachers to build their own formative assessments and integrate them within their own instructional content facilitating the integration of assessment with instruction. As we all know, education is changing at unprecedented speed. Formative assessment reflects one aspect of that change. In the last year alone ATI has witnessed a dramatic increase in formative assessment as part of a larger movement toward online assessment. In addition, there is a growing realization of the importance of integrating assessment with the instructional process. Over the past several years, ATI has developed technology, including the Galileo Digital Curriculum Platform, designed to assist educators successfully integrate assessment and instruction. With ATI’s proprietary agile software technology, innovations are occurring at a rapid rate. We will keep you posted.